In this blog, we meet Ajay Mahadevan, a 2018 B.Tech graduate, who got a chance for his dream fresher job, just 10 days after giving the AMCAT exam. How AMCAT helped Ajay Mahadevan land a fresher job. Often, we are asked by prospective AMCAT test takers and candidates who have taken it, when would they receive the first set of interview calls for the promised, matched jobs. Our answer varies. 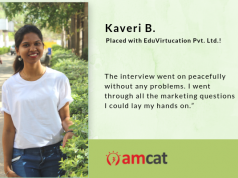 Based on the set of AMCAT success stories we have received till now, it can be anywhere from three weeks to three months. Till now. In this blog, we meet Ajay Mahadevan, a 2018 B.Tech graduate from the Dhanalakshmi College of Engineering. And how he got a call as early as ten days after giving the AMCAT exam. 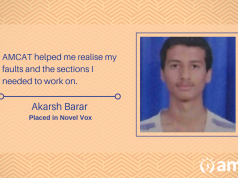 Ajay prepared for his aptitude test by studying up on model question papers and practising different sets of aptitude questions. 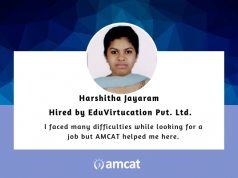 “Please do read all the amcat questions available on the internet and focus on solving aptitude questions along with your major subject”, he advises. And it helped. He received his first job interview call within just 10 days. Next, we asked him about his selection for Cozystay Technologies. Particularly, how he fared at the job interview. Congratulations Ajay Mahadevan for making your way through in the job selection for Cozystay Technologies. We hope your story lends a hand to those preparing for the AMCAT or thinking about giving the skill assessment.